The Commonwealth Silver and Gold Corporation’s sign outside of the Commonwealth Mine in Pearce, Arizona is pretty impressive. This Canadian corporation claims that they are “Bringing Responsible Mining and Basic Industry Jobs to Southeast Arizona”. Wow… That’s what we all want to hear! Now let’s break this down further… First of all, the “Commonwealth Silver and Gold Corporation” goes by different names depending upon who they’re targeting at any given time. 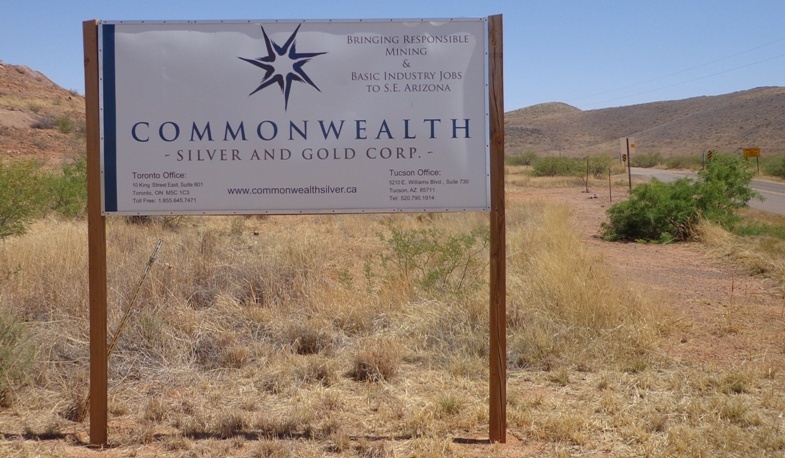 In addition to the name of, “Commonwealth Silver and Gold Corporation”, they reported their company name to the Arizona Range News as, “Commonwealth Minerals”. On LinkedIn, Michael Farrant the company CEO presents the company name as, “Commonwealth Silver and Gold Mining Inc”. In addition to these name variations, the company calls itself, “Commonwealth Silver” on their website. From a marketing standpoint this is poor branding. However, we believe the variations in names given is more sinister, such as a criminal that uses multiple aliases. As for providing the communities of Pearce-Sunsites with new jobs, this won’t happen. First of all, they will not bring any new jobs because they don’t want to hire “outsiders” that may tip off what’s really going on at the mine and rattle the EPA or their valued shareholders. Also, no one with a soul would call developing a “100 meter deep open-pit cyanide-leach silver-gold operation” directly across the road from an elementary school “responsible”. If we were to see this happening in a third-world country we would be outraged. However, most third-world countries are prudent enough to not allow a 100 meter deep open-pit cyanide-leach mine to be developed on their soil today, due to the awareness of the dangers open-pit cyanide mining poses to public health and the environment. But we live in Arizona, where individuals and our government officials (such as Jan Brewer and John McCain) foolishly believe that open-pit cyanide mining won’t hurt our people or our environment. Therefore, we are all going to sit and take a wait and see approach until people become sick and our land is poisoned with cyanide. Is this what Commonwealth Silver and Gold Corporation means by “Bringing Responsible Mining and Basic Industry Jobs to Southeast Arizona”? This is the sign you see when you actually get to the entrance of the Commonwealth Mine. 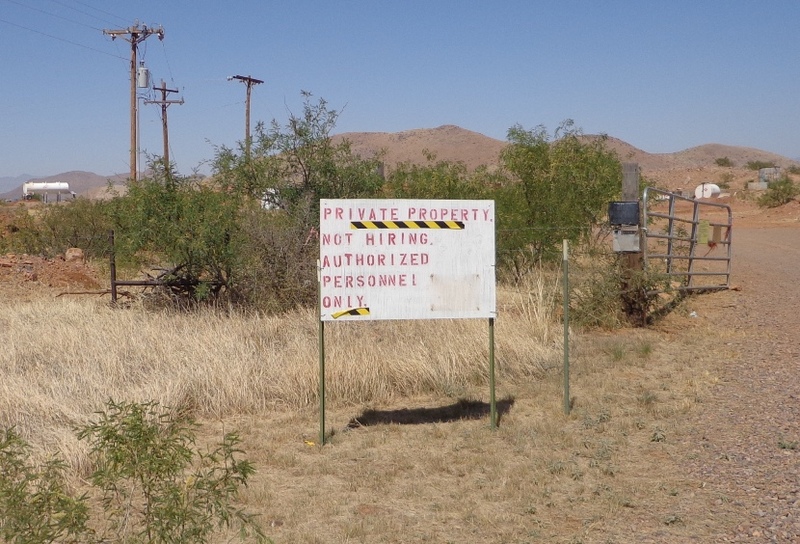 Note the words, “Private Property”, “Not Hiring”, and “Authorized Personnel Only”. Where are these “Responsible Mining and Basic Industry Jobs” for Southeast Arizona? If you’re really curious, go ahead and walk through this gate AT YOUR OWN RISK. If you happen to be one of those types that wants to go straight to the top you can contact Michael Farrant, President and CEO via email at mfarrant@commonwealthsilver.ca or call him on his cell at 416-278-4149. This entry was posted in Uncategorized and tagged Arizona, Commonwealth Mine, Commonwealth Silver, Employment, Jobs, Pearce by CommonwealthMine.org. Bookmark the permalink. Hopefully it never opens, if it does you lives and homes are worthless. I was planning on retiring there. Not so much anymore. They will not only scar the earth, they will kill everyone. No, the mine has not opened due to dissent from the local community and lack of financial backing. We sincerely appreciate your interest. Jobs will be advertised, but since the majority of our community members are older and retired, or younger people not skilled in these types of jobs, local folks will not be the ones with the new jobs. At the meeting last night, the talk was all encouraging to our young people that they can start right now with their education and get their degrees in many of the job related areas…but how many of them will want to put $100,000.00 into these education fields and then get a job that pays $15.00 per hour? Wonder how long your student loan payoff will take at those wages? Not to mention, if it takes a graduating senior 4 to 8 years for a degree, the mine jobs will be all be taken up by the time you get back here anyway….filled by people just like the owners…not from around here. The single most telling question/answer from last night’s meeting was when asked if he would live next to a gold mine project, his answer was “I didn’t buy my house next to a mine”. Well, that tells me how safe and wonderful this is going to be….NOT. This mine will not create any real jobs, and any that they do will only last a few years at best. Then what is our community supposed to do after they’ve sucked up all of our water and left our land a toxic waste dump? Think people. Any estimate on when the mine will open? No word. Marlin Gold Mining Inc. still hasn’t talked with the local community.